Stephanie Meadow in action at County Louth last season. Photo Jenny Matthews/www.golffile.ieLeona Maguire and Stephanie Meadow have not exactly had the luck of the draw in the first round of the US Women’s Amateur Championship in South Carolina. They’re playing each other. Alabama based Meadow shot rounds of 72 and 73 to share 22nd place and qualify comfortably among the top 64 for the matchplay stages on three over par with Leona Maguire a shot further back in 30th after scores of 75 and 71 at the Country Club of Charleston. Leona’s twin sister Lisa Maguire failed to qualify, missing the top 64 by four shots after rounds of 82 and 72. Yumi Matsubara, a 14-year old from Japan, shot a championship record, seven under 64 in the second round to top the qualifiers on seven under 135 - five strokes clear of Americans Allisen Corpuz, Emma Talley and Yueer Cindy Feng. Greystones’ Paul Dunne battled food poisoning and exhaustion to qualify for today’s first matchplay round of the weather-delayed US Amateur Championship but Gary Hurley and Cormac Sharvin face an uphill task to keep their hopes alive. Stephanie Meadow with her former coach Han Hankey. 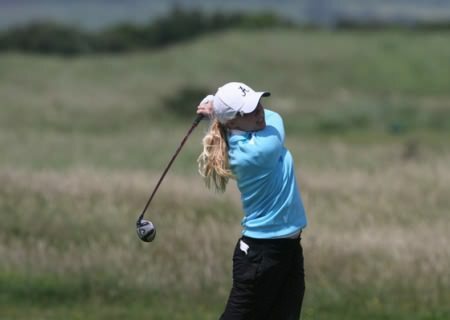 Pic courtesy www.ijga.comStephanie Meadow has been named alongside twins Lisa and Leona Maguire in the 12-strong Great Britain & Ireland preliminary squad for the 37th Curtis Cup match against the United States at The Nairn Golf Club from June 8-10. Leona MaguireDefending champion Leona Maguire is six shots off the pace at the halfway stage of the Portuguese Ladies Amateur at Montado Golf Resort near Lisbon. The 17-year old from Slieve Russell posted a two-over par 74 on a bright and breezy day, reaching the turn in level par before the wind strengthened on the tougher inward nine. Her sister Lisa played well but was left to rue double bogeys at her first and last holes as she posted a frustrating 76 to finish the second round nine strokes behind Germany’s Rebecca Roeller, who leads the field by four after adding a 74 to her opening 66. Stephanie Meadow. Picture via ILGU.ieTopping the qualifiers usually guarantees an accessible first round opponent but world amater No 7 Stephanie Meadow won’t be relishing her clash with Irish Girls Strokeplay champion Olivia Mehaffey in the Irish Women’s Close at Ballybunion on Friday. McGinley on Clarke and Westwood's "bottle"
Harrington cuts himself some slack - "I’m a lot more patient...more tolerant. I’m more like me"